Hi! Today I’m going to write an article about basic Git usage in practice. 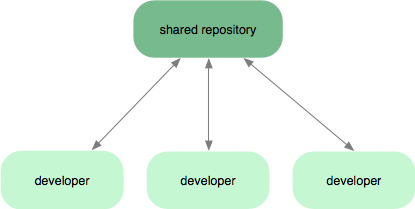 I’m not going to go into depth of Git repository setup, but rather on developer’s side – what’s important to understand to start using it? Allow developers to work with Git as they did before it. I’ll be explaining the logic through console approach because of clean informations you get, and you’ll get yourself familiarized with Git project workflow. Ok, I really haven’t show any rocket science here. I just show you a graphic that represents any repository. But it’s important to understand that only when each developer pushes his commits to shared repository, it will be available to his colleagues developers to pull them. And you must know the difference between local and remote (shared) repository. 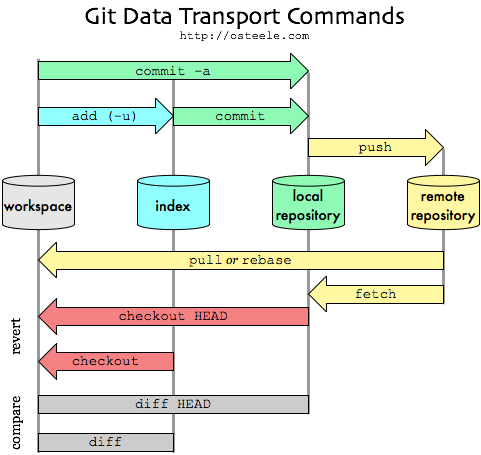 Now, this is the best graphic I found that would in brief and yet comprehensive way show the workflow between the developer and remote repository. Don’t worry if you think that it’s too complicated, or if you’re scared of commands. It’s pretty simple. Like (almost?) with any other repository, Git is cyclic. It means nothing but you pull the changes from others, do your changes, commit them, and finally push them to repository for others. Then, you just repeat the process. //And leave amessage "index.php added"
$git commit -m "index.php added"
And there you go. Your first file added to Git. And as I wrote before, you now just need to repeat the process. I haven’t gone into depth of project setup, I just wanted to show everyone how to use basic console commands. And I hope someone will find something useful in here! Thanks for the wonderful explanation of git commands, so precise and clear! It’s worth the look and could help a great deal in visualizing the process and learning the terminology.